With a petrol engine, fuel is transferred via an electronic pump known as a fuel pump. This fuel subsequently passes though a filter that removes most contaminates that have entered (or corroded from) the fuel tank. 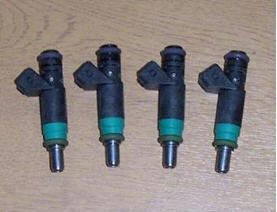 This filtered fuel then enters one end of a common feeding tube for an engine's fuel injectors called a fuel rail. The other end of this rail is met by a pipe that leads back to the fuel tank - called a return pipe. This pipe contains a fuel pressure regulator (essentially a resistor, or blockage) that ensures all fuel within the fuel rail is kept at a constant pressure (essential for precise metering of fuel). 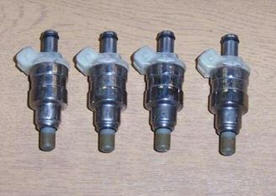 Modern injection systems take into account air temperature, driver demand, air density, exhaust gas composition, crankshaft and camshaft positioning during fuelling. These variables are received by the engine's control unit (ECU) and directly affect both how much and how often fuel is injected into the engine's cylinder head. 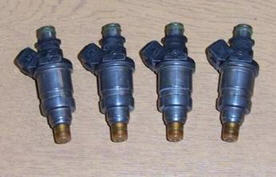 These 12 types of injectors account for most applications. 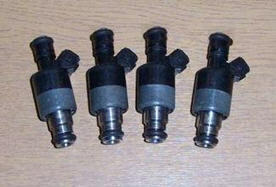 Spray patterns change due to varnishes and contaminates from the engine side of the injector adhering to the injector pintle and effectively obstructing the path of the injected fuel (it is also caused by using fuel supplied by some 'budget' retailers of petrol who decline to add sufficient amounts of polyetheramine to the base petrol. Polyetheramine is a highly effective fluidiser that inhibits adherence of contaminates to the injectors, valves, pistons and the cylinder head). Some of these are also symptoms of clogged micro filters. 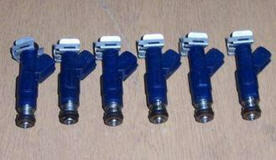 Each injector contains its own small filter to 'strain' foreign objects from the fuel supply entering the injector. 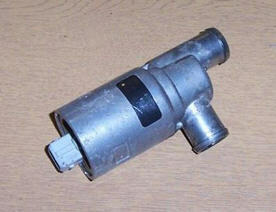 These objects typically enter the fuel supply during refuelling and are too small to be caught by the main fuel filter. After around 50,000 miles of general road driving these contaminates caught in the injector's micro filters will reduce the maximum volume of fuel available to be delivered over a given period of time by about 5%. In extreme cases fuel starvation can occur, causing any given engine cylinder to run 'lean', overheat and damage the engine internals (pistons and bores). 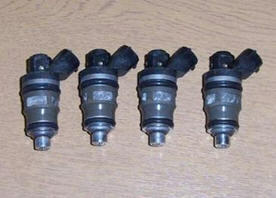 Clogged or dirty injectors can be catastrophic for engines utilising forced induction (turbo or supercharged) as a situation where demand for fuel can exceed supply - causing cylinders to run lean and destroy the engine though the creation of excess heat. 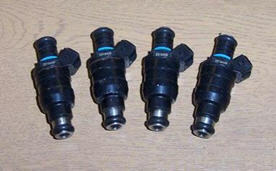 Clogged injectors will also introduce an unknown quantity when calculating safe over-boost levels for forced induction applications.